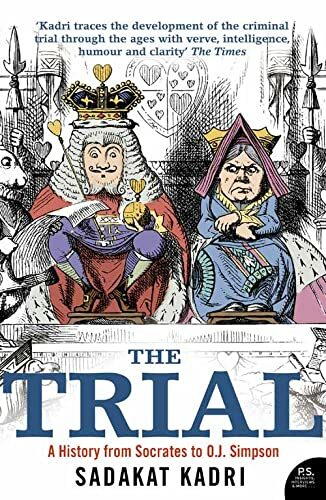 In an extraordinary history of the criminal trial, Sadakat Kadri shows with wit, legal insight and a travel writer's eye for detail, how the irrationality of the past lives on in the legal systems of the present. A bold and brilliant debut from a prize-winning new writer. In an extraordinary history of the criminal trial, Sadakat Kadri shows with wit, legal insight and a travel writer's eye for detail, how the irrationality of the past lives on in the legal systems of the present. A bold and brilliant debut from a prize-winning new writer. `The Trial' spans a vast distance in time, opening in the dread silence of the Egyptian Hall of the Dead and ending with the melodramas and hubbub of the 21st-century trial circus. Reconciliation and vengeance, secrecy and spectacle, superstition and reason all intertwine continually. The book crosses from the marbled courtrooms of Athens through the ordeal pits of Anglo-Saxon England, past the torture chambers of the Inquisition to the judicial theatres of 17th-century Salem, and from 1930s Moscow and post-war Nuremberg to the virtual courtrooms of modern Hollywood. Kadri shows throughout how the trial has always been concerned with doing more than guaranteeing fairness and holding human beings to account for their deliberate crimes. He recounts how insentient and irrational defendants from caterpillars to corpses were once summonsed to court, before being exiled for their failure to attend or sentenced to die again - and argues that the same urge to punish lives on in today's trials of children and the mentally ill. But although Justice's sword has always been double-edged - as ready to destroy a community's enemies as to defend its dreams of due process - the judicial contest also operates to enshrine some of the western world's most cherished values. The show trials of Stalin's Soviet Union were shams, but Guantanamo Bay and Abu Ghraib are a reminder that a lack of a trial is equally unjust, and at a time when our constitutional landscape seems to be melting away, an appreciation of the criminal courtroom's history is more necessary than ever. As the Labour government launches an almost annual attempt to truncate trial by jury, and as authorities on both sides of the Atlantic are indefinitely detaining people in the name of an endless war on terror, `The Trial' could hardly be more timely.